Here’s a fun way to create a Christmas display within minutes, and a perfect project to work on with kids. 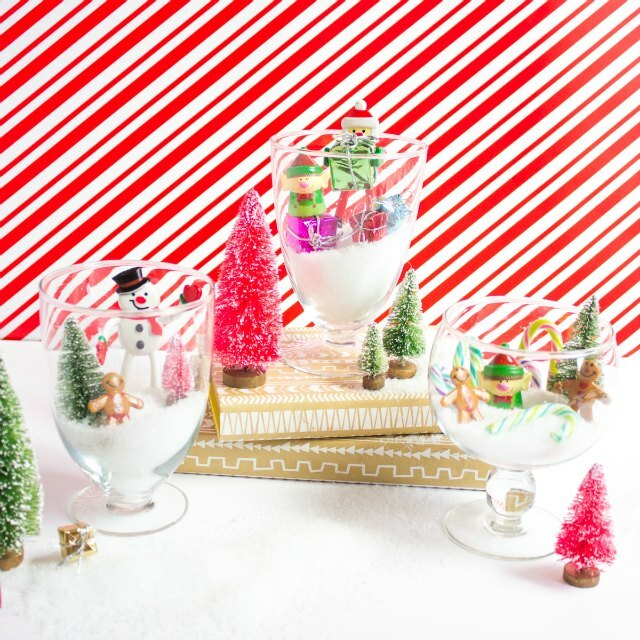 These simple and sweet Christmas terrariums capture mini holiday scenes like Santa Claus holding a present, a little elf in a field of candy canes, or a snowman waving among Christmas trees. They are like snow globes without the water! 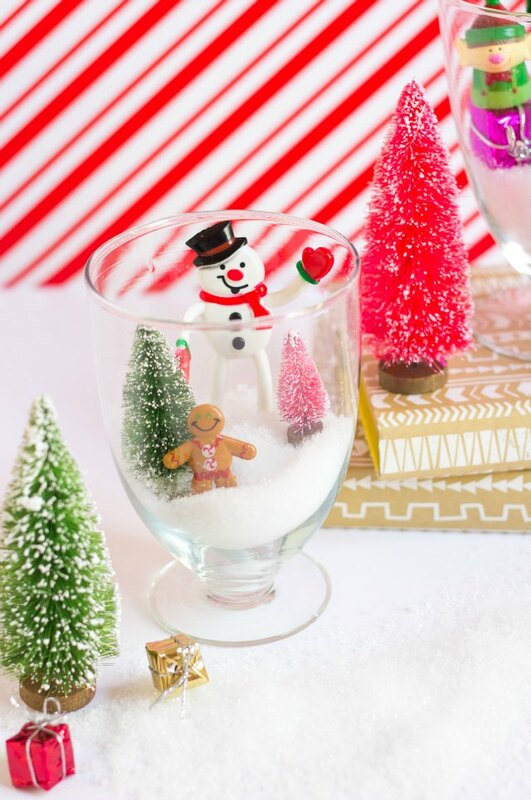 All you need are some glass jars, faux snow, and little characters, trees, and candy to place on top. When displayed as a group together the terrariums look so sweet! These are my latest terrarium project for Oriental Trading using their set of three glass jars. It has been a fun challenge to switch them up for different holidays and in case you missed them, I’ve also made a version for Easter, Halloween, and fall. I think you need your own rotating holiday terrarium display, don’t you?! 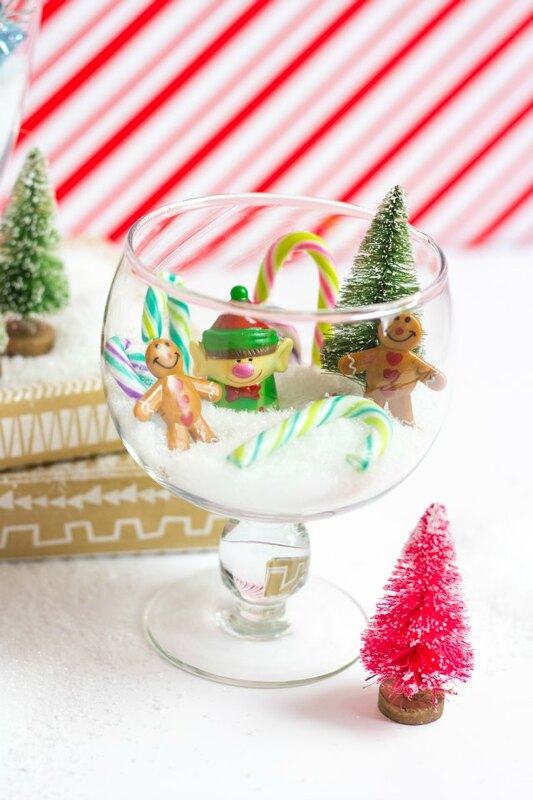 Read on to see how cute these Christmas terrariums turned out! These little elves are actually finger puppets! 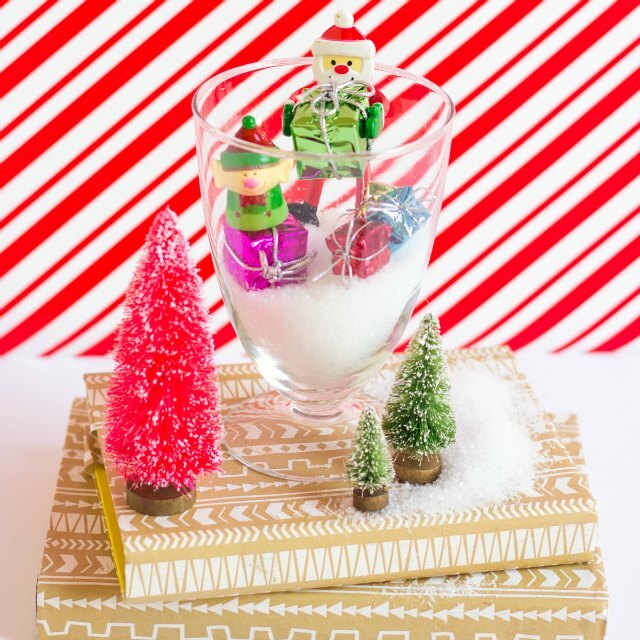 Any small Christmas characters and mini ornaments would work for this project, and mini bottle brush trees are always a must! To make your display more interesting, try varying the height of the jars using books or small boxes and incorporate some of the elements outside of the jars like the bottlebrush trees and even some snow! Check out the Easter, Halloween, and fall terrariums I made using these same glass jars, and head to Oriental Trading’s blog for the full list of supplies and step-by-step Christmas terrarium tutorial!